Hi friends! 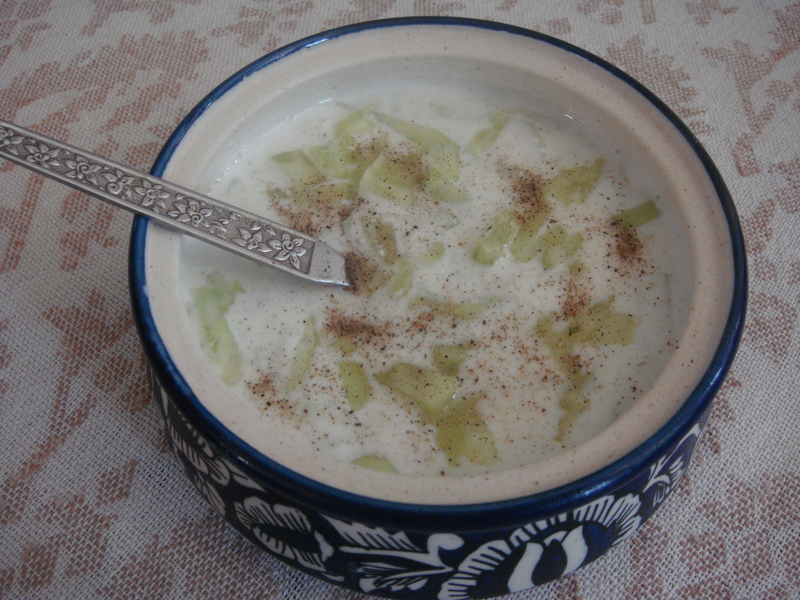 Here is a simple, delicious and very healthy recipe of an Indian side dish of yogurt/curd/Dahi containing grated cucumber and spices. A no flame ,very healthy, tasty, easy to follow curd based recipe.This preparation provides protein. Natural live cultures are good for body. Wash and peel cucumber. Grate one half of the cucumber in a bowl and chop second half of the cucumber in to small cubes in the same bowl. Take the yogurt in a mixing bowl, beat it to a smooth texture. Add the salt, cumin powder, pepper to the beaten curd. Mix or fold in the grated and cubed cucumber and mix well. Refrigerate till served. Serve as a side dish with all the rice preparations and Indian breads . Cucumbers are a good source of B vitamins. Cucumbers are 95 percent water, keeping the body hydrated while helping the body eliminate toxins. Cucumbers have most of the vitamins the body needs in a single day. Cucumber cures diabetes, reduces cholesterol and controls blood pressure. Cucumber juice contains a hormone which is needed by the cells of the pancreas for producing insulin which has been found to be beneficial to diabetic patients. Researchers found that a compound called sterols in cucumbers may help reduce cholesterol levels. Cucumbers contain a lot of potassium, magnesium and fiber. These work effectively for regulating blood pressure. This makes cucumbers good for treating both low blood pressure and high blood pressure. Health benefits of curd:Being rich in calcium, curd is good for the health of bones as well as the teeth. For those who have difficulty in the digestion of lactose in milk, yogurt is an important source of calcium. Curd contains an enzyme which breaks down lactose to aid proper digestion.Curd / Yogurt is rich in vitamin D which helps our body to absorb and use calcium.Curd / Yogurt helps you feel fuller and is thus, a very good snack for those trying to lose weight. Very helpful. How can I make Pumpkin Raita for my diabetic husband who suffers from diarrhea often. Avoid anything with sugar. pumpkin soups, pumpkin raita should be good for him.Yogurt is especially effective in stopping or lessening diarrhea (but not for infants). Do confirm with your doctor before including this in his diet. Do check out my other diabetic-friendly recipes.